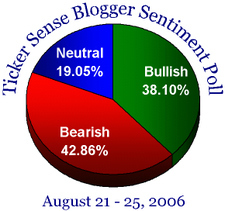 Overall, market bloggers became slightly more bullish last week after the S&P 500 registered 5 consecutive days of gains. How can I be part of the sentiment poll? And tell Laszlo that Steve Blitz says hi.